Hi all. Keep having switch issues with my JP and the trex apparently. All the switches test fine. During the diagnostic and game phases, however, the trex doesn’t always chomp (eat the ball) and sometimes the up and down sensors do not register. Again they do during test phase but not gameplay. He intermittently eats the ball but most times not. I tried adjusting the switches but no fix yet. Thoughts? check if yours is one of the early games prior to 87012. There is a service bulletin for this game specifically for the t-rex. There is a article on it in playmeter magazine. Also check if you have the latest code [rom revision 5 i believe]. it helps with the dino operation. Could be binding and not operating right in game and work in test. Switches can be flaky. Sometimes when operated slowly after not working for a game or 2 they become sticky internally and do not actuate correctly until the second time. I found my T-Rex had trouble eating the ball when the game was not level. Make sure the scoop the ball sits in isn't cracked or broken. Mine was cracked and she would drop the ball, got a new one and has worked ever since. If he does a LATE Chomp only on the way up I had the same problem. Take him apart and look at the wiring. Most likely after all that up and down the wire has broken in half and is only touching when in the upright position. I cut each side and soldered a new in between wire with more slack. Yup agreed. Check wires, and if you want you can upgrade them to a more multistranded wire. Great for things like this but not cheap. Oh yea.The JP article was in the vol 19 august 1993 PlayMeter mag. Check it out jurassic owners. neat read. Has great picture with Gary Stern in the egg room wth the cast of JP in the main article besides the dino update. Thank you all. Got some diagnostics to do and will report back. Seems like I should take the whole thing apart for now. This should be fun. Its not that hard. Turn the machine on and then off wjen the trex lowers. Then remove the plastic playfield collar , thwn the back of Trex ( just one screw ). Then trace the wire and consider splitting the casing to check the black and white wires at the bend point. Took the t Rex apart and all wires look fine and test fine. One was slightly crimped but every time I test the jaw in diagnostics it works at all levels. I tested the switches all work. Scratching my head. I’ll post pics if it will help but open to other suggestions. Again the only issue is that the trex doesn’t always pick up the ball when it goes down to do so in game play. Looks like the yellow saucer is cracked. Replace that and try to play it again. The dino will not act right if that saucer is damaged. I will scan the pages from the magazine when I get a chance. I am looking right at the Magazine right now. also make sure any screws are in and tight the way they should be. And this is probably a dumb question but why would the plastic saucer matter if it’s cracked? 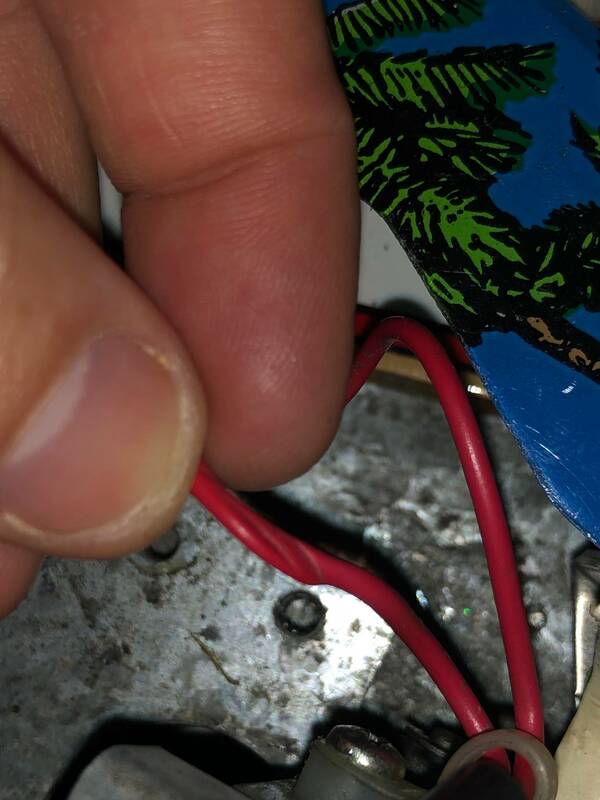 If the switch works and the ejector works what would be the issue? Why would the mouth not close on it? the ball will not sit right or get pressed down or what have you. I cannot see how bad yours actually is but from the pic it looks cracked and may be hampering operation. If its cracked it needs to be replaced anyways so no harm done. I'm having the same issue. T-rex begins to raise, then chomps. He has raised about 1/8" to 1/4" when the chomp happens so he just knocks the ball out of the hole. again switch adjustment is key. Plus as switches age the sweet spot changes and takes longer to activate and reset for another operation. Could be yours are just old and need replacement. But adjusment is paramount. Once its done it works flawlessly. great design. But our favourite games are getting on in age friends. So odd. Mine goes down, doesn’t chomp at all, then chomps at top. The ball sits there then auto pops out. Frustrating. I’m trying to find a new saucer. It’s not cracked bad, but it is cracked. The ball registers in the saucer every time however. Just odd. Ya I may just order all new switches. Also while I’m in here should I oil this bad boy up or go through a cleaning? She’s dirty. I got most of the switches to be consistently on when in proper position. Sometimes up lags or is off. But again all test fine. Anyone got a link to the saucer? how well does your saucer switch work? Check that bad boy. If its flaky it will forget the ball is in the saucer and not chomp. Maybe try switch test and bang on the middle of the playfield and see if any flake out. or any double switch activations or any weirdness at all and report back. Just clean everything and maybe the slightest wipe of grease on metal to metal contact points only. NO WD! . get synthetic grease. Great stuff. never goes bad. no but he needs it anyways from the look of his. I think its a switch issue for sure. 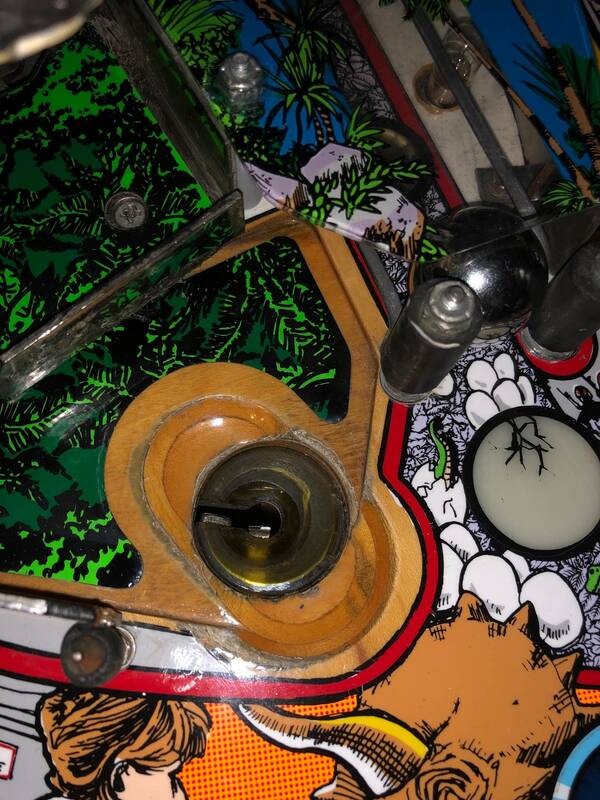 And here's how to remove the tabs, https://pinside.com/pinball/forum/topic/jurassic-park-restoration/page/9#post-4149188. No one sells them without the tabs anymore. Mine didnt seem cracked very bad either (if i recall it looked a lot like yours) but it was enough to keep the ball from sitting up high enough for the rex to grab it. It always amazes me how something being the smallest bit out of adjustment can change the way a game plays. Rex grabs the ball, brings it up then swallows, and chomps at the top after swallowing the ball. If you want to try a quick test with the saucer before buying a new one, switch the TRex saucer plastic with the one in the top right in the Boat Dock. Same part. So I think I figured out why it’s not working. 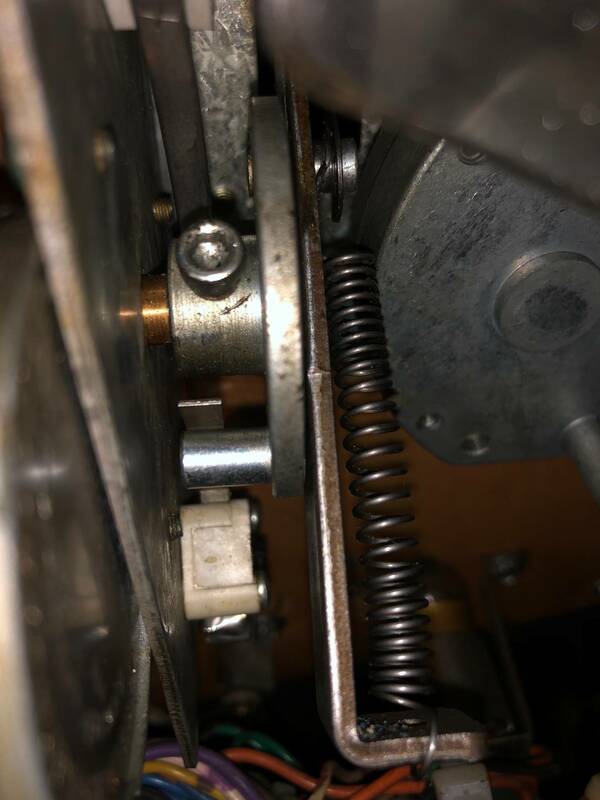 The tRex up and down motor will sometimes go all the way around and then sometimes it goes backwards. When it goes backwards it gets caught behind the down switch and then kicks back over. If I bend the switch so it triggers both ways it doesn’t work properly. Is the motor supposed to go both ways? Or is it just supposed to go clockwise? I watched the times it ate the ball and it only ate the ball when it went clockwise. 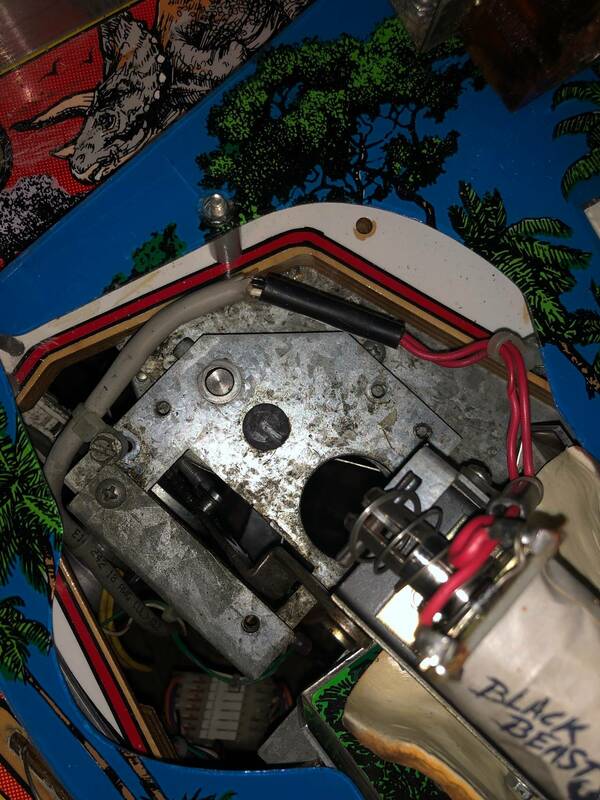 Anyone mind showing me a picture of their switches underneath the playfield? For the tRex? Found this in the manual, so it looks like it does turn in both directions. Thanks. My top switch will work going both ways but the bottom only one way. Is that normal? See how the motor hits the bottom and then goes the other way but the top doesn’t do that. I bent the switch to work both ways on the bottom but then the trex really wouldn’t work.